Such an extensive list of achievements makes it almost impossible for us to discuss every single prize winner. Instead we take a closer look at Gino's three national ace pigeons KBDB 2017, which have won 50 top 10 placings together. Is she the big star of 2017 in team Gino Clicque? This hen became 1st National Ace Pigeon KBDB Yearlings Long Distance and 9th National Ace Pigeon KBDB Yearlings Allround. Her palmares this season includes a 1st National Zone A of 1,342 yearlings (6th National of 5,117 pigeons) and a 42nd National Limoges. Golden Princess is a granddaughter of the world famous Golden Prince (from her mother's side), which was sold for a record breaking 360,000 EURO in 2017. 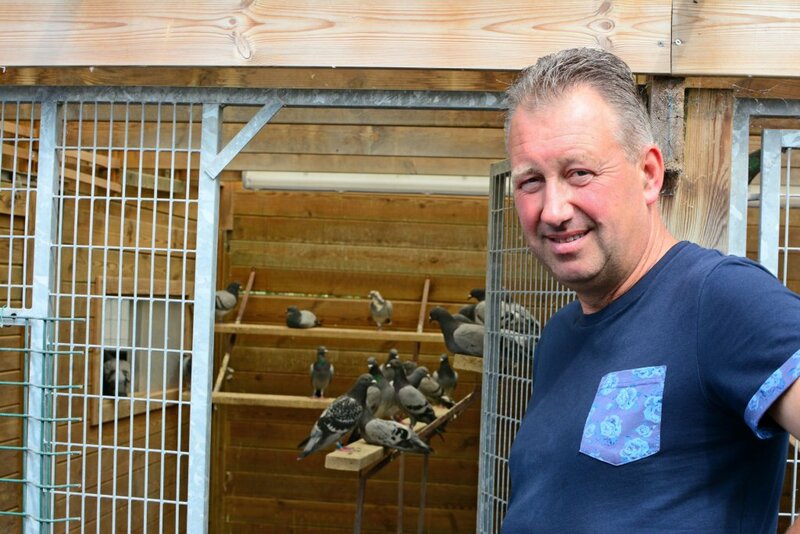 Golden Prince became 1st National Ace Pigeon KBDB Long Distance in 2014, after winning three top prizes in a single season: 3rd National Brive of 3,850 pigeons, 4th National Tule of 5,731 pigeons and 14th National Limoges of 6,907 pigeons. 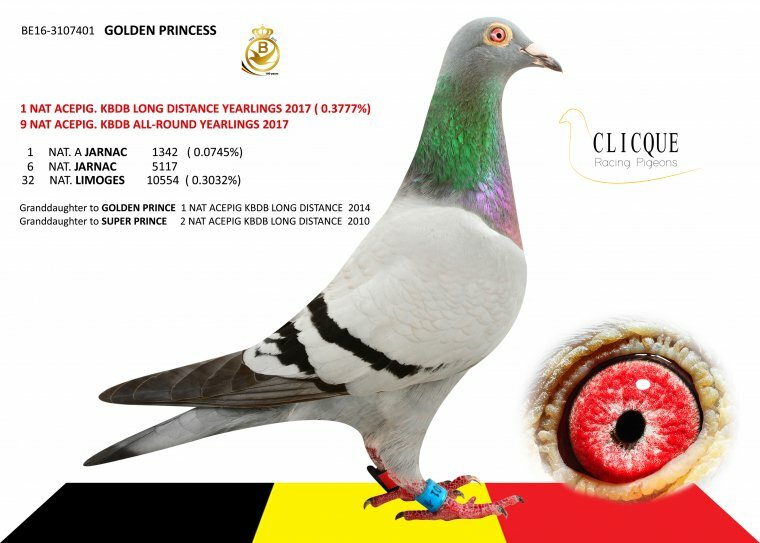 His granddaughter has now won a gold medal in the KBDB ace pigeon competition as well, which goes to shows that Golden Prince is a truly unique pigeon. The sire of Golden Princess has some excellent origins as well. He is a son of Super Prince, winner of a 4th National Bourges (10,906 pigeons), 5th National Bourges (22,476 pigeons), 6th National Argenton (10,549 pigeons), 12th National Bourges (22,499 pigeons), etc. He became 2nd National Ace Pigeon Long Distance KBDB in 2010. He is the grandfather of at least three national winners. This and much more can be found in the impressive pedigree of Golden Princess. Limo had an excellent racing season. She won a 1st Provincial Limoges of 1,933 yearlings (6th National of 10,554 pigeons), and a 42nd National Jarnac of 5,117 pigeons. 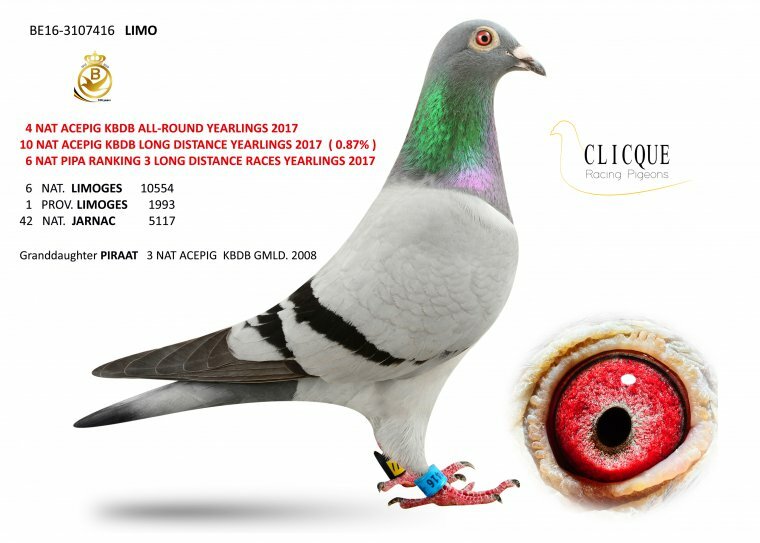 This resulted in the title of 4th National Ace Pigeon KBDB Yearlings Allround and 10th National Ace Pigeon KBDB Yearlings Long Distance. She finished in 6th place in the PIPA ranking long distance (3 prizes). The sire is a son of Piraat, 3rd National Ace Pigeon KBDB Longer Middle Distance 2008. The dam is Erica 804, a daughter of Brother Anita (5th Provincial Tours) x Mireille (the dam of a 1st Provincial Montelimar). Feel free to take a closer look at the full pedigree. 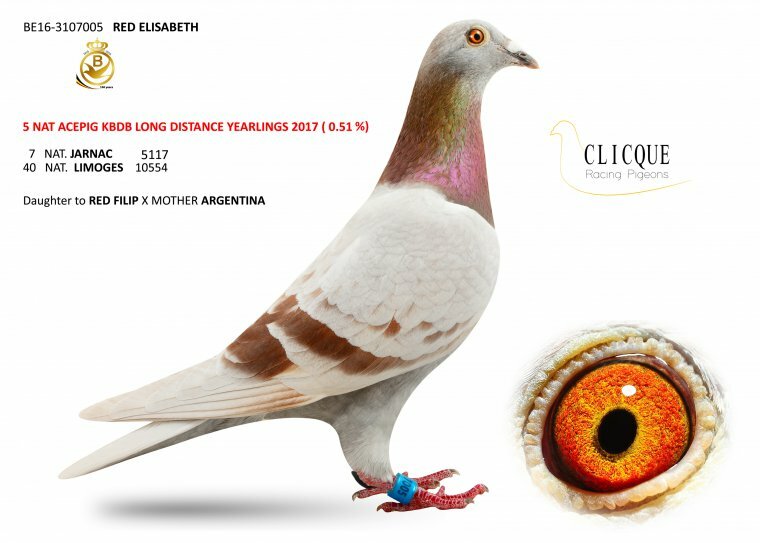 Red Elisabeth had an excellent 2017 season as well: she won a 7th National Jarnac (5,117 pigeons) and a 40th National Limoges (10,554 pigeons). This resulted in the title of 5th National Ace Pigeon KBDB Long Distance Yearlings. The sire is Red Filip, an excellent racing bird and winner of 2 top 10 prizes in the national long distance: 2nd National Cahors (7,140 pigeons) and 6th National Souillac (5,282 pigeons). The dam is also the dam of Argentina, 6th National Ace Pigeon KBDB Longer Middle Distance and 7th National Montluçon (19,298 pigeons). This pigeon's pedigree features several more talented pigeons. Gino Clicque made the news twice this season: with his exceptional auction on PIPA in March 2017, and with his remarkable results in the racing season. His racing team is all set to tackle the 2018 season, and this time he will have a group of old birds at his disposal as well. His yearlings proved overwhelmingly strong this season, and we can imagine his opponents are not too eager to be facing these same pigeons again in 2018. Limo, Golden Princess and Red Elisabeth are three of the team's most valuable racing birds that have now been transferred to the breeding team. The other successful yearlings of 2017 will start the 2018 season as part of the racing team. The yearlings' team for 2018 will consist of carefully selected youngsters, from the last round of the Gino Clicque 1.0 generation. We are looking forward to what the Clicque racing team has in store for us.